WASHINGTON (CNN) -- Congressional Republicans tore into the Obama administration over the economic stimulus plan Wednesday, arguing that the White House is mishandling the distribution of the money while overstating the ability of the package to create jobs. 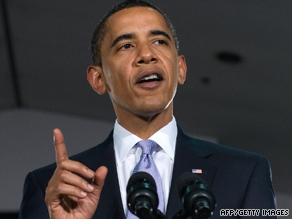 President Obama says his administration would not want to change its approach to the stimulus plan. They criticized the White House for referring to the number of "jobs created or saved" by the $787 billion package -- a metric, they claimed, that is impossible to verify. The White House Office of Management and Budget defended the plan, arguing that every federal dollar spent has, by definition, helped to ease the pain of the worst economic crisis since the Great Depression. The Republican and Democratic leaders traded their arguments during a contentious hearing before the House Oversight and Government Reform Committee. "In selling the stimulus package, the administration promised the American people that [the] legislation would create or save 3.5 million jobs and prevent the U.S. unemployment rate from rising above 8 percent," said Rep. Darrell Issa, R-California. "I believe that the discredited Keynesian theory behind the effort is misguided, and I am convinced that it won't work," said Issa, referring to the theories of economist John Maynard Keynes. "Unfortunately, recent economic data has validated my opposition." The economy has shed 3.4 million jobs over the past six months, according to the Department of Labor. The unemployment rate rose for the ninth straight month in June, climbing to 9.5 percent and hitting a 26-year high. "From the moment he was elected, the president has put the economy front and center," countered Rob Nabors, deputy director of the White House Office of Management and Budget. "We are slowing the economic freefall [and] the recovery act is an important part of that effort. ... It's a work in progress, but it's steady progress." Nabors said the reported loss of 467,000 jobs in June was disappointing, but it nevertheless represented an improvement from the 691,000 jobs lost on average in the first three months of the year. Republicans also criticized the use of stimulus funds to extend unemployment insurance. That kind of spending, while beneficial in some ways, does not "dollar for dollar, create or save a job," Rep. Jason Chaffetz, R-Utah, said. "I don't see how you can say that," Nabors replied. "We believe that any dollar spent in the federal system will create or save a job, because what's going on is we are putting dollars into people's pockets to spur demand." Congressional Democrats offered mixed reviews, arguing that the package was necessary, but improvements could be made in its implementation. "Frankly, there is good news and bad news," said the committee's chairman, Rep. Edolphus Towns, D-New York. "The good news is that money is flowing from the federal government to the states at a faster rate than the Congressional Budget Office predicted at the beginning of this year." The bad news, he said, is a General Accounting Office finding of "significant shortcomings in the targeting and tracking of recovery act spending." Stimulus money should be primarily directed toward economically distressed areas, Towns said, but states vary substantially as to what constitutes such an area. Although many leading Republicans say the stimulus plan has been a waste of money, some economists -- like Nobel Prize winner and New York Times columnist Paul Krugman -- have argued the original measure was too small. Vice President Joe Biden said Sunday that the administration "misread how bad the economy was," but he told ABC's "This Week" that the pace of the stimulus program would be increasing. Speaking on NBC's "The Today Show," Obama on Tuesday said "rather than say 'misread,' we had incomplete information." He also told ABC's "Good Morning America" that "there's nothing that we would have done differently. "We needed a stimulus and we needed a substantial stimulus," he said. Democratic leaders in Congress are now kicking around the idea of another stimulus. House Majority Leader Steny Hoyer said Tuesday he would consider supporting a second economic stimulus bill, but added that people need to give the package that passed in February more time to work. The president said he's not taking the idea off the table, and one of his top economic advisers has already called for one. Republicans, however, have accused the White House of not getting its story straight. "They said the stimulus was necessary to jumpstart the economy. Yet now, with about a half million jobs lost every single month, they've started to admit that they simply 'misread' the economy. These were costly mistakes, and we can't take them back," Senate Minority Leader Mitch McConnell said Tuesday. Despite a tough year for Republicans, GOP strategists say the economy is part of the party's road to recovery. "Nothing has really galvanized the Republican Party more than the stimulus vote," Republican strategist Doug Heye said. "One thing that we've seen is that the president's popularity, while he's still popular throughout the nation, really is taking hits in key states." CNN's Jim Acosta and Deirdre Walsh contributed to this report.